Pierre Simon Laplace's work in both celestial mechanics and probabilityrepresent pinnacles of intellectual achievement. Laplace extended the work of Isaac Newton, explaining variations in the planetary orbits and establishing the stability of the solar system. In addition, Laplace's nebular hypothesis used natural law to explain the origins of the solar system, providing a new cosmogony. His work in celestial mechanics led him into the area of statistical inferenceand probability, to which he made substantial contributions. In physics, Laplace's theory of the potential enabled advances in the understanding of electromagnetismand other phenomena. He also predicted the existence of black holes. Laplace was born on March 23, 1749, in Beaumont-en-Auge, Normandy, France, to Pierre and Marie-Anne Sochon Laplace. His father was in the cider business and an official of the local parish; his mother's family were well-to-do farmers from Tourgéville. Laplace had one sister, Marie-Anne, born in 1745. From age 7 to 17 he was a day student at the Benedictine school at Beaumont-en-Auge, where his paternal uncle, Louis Laplace, an unordained abbé, was a teacher. Laplace was recognized for his intelligence, prodigious memory, and skill at argument. In 1766, Laplace entered the University of Caen for theological training. His mathematical interests and talents were readily apparent, however, and he was encouraged in mathematics by his teachers, Christophe Gadbled and Pierre Le Canu. In 1768, at the age of 19, Laplace went to Paris to meet the mathematician Jean d'Alembert, carrying a letter of recommendation from Le Canu. Legend has it that d'Alembert twice gave Laplace mathematical problems and Laplace solved them overnight. In any case, d'Alembert, who was permanent secretary of the Paris Académie Royale des Sciences, was sufficiently impressed with Laplace's abilities that he used his influence to secure a job for him at the Military School, where Laplace taught elementary mathematics to young cadets. Several years later, in 1785, 16-year-old Napoleon Bonaparte attended the school and Laplace examined and passed him. Settled in Paris, Laplace began to submit mathematics papers to the Académie. Nicolas Condorcet, the secretary, wrote that never had the Académie received in so short a time so many important papers on such varied and difficult topics. Laplace was proposed for membership in 1771, and was elected to the Académie on March 31, 1773, at age 24. Laplace's first contributions involved adapting integral calculus to the solution of difference equations. He then addressed problems in mathematical astronomy. He explained the observed shrinking orbit of Jupiter and the expanding orbit of Saturn, demonstrating that the orbital eccentricies are self-correcting and that mean motions of the planets are invariable. Laplace also addressed and explained the acceleration of the moon around the Earth, cometary orbits, and the perturbations produced in the motion of the planets by their satellites. From 1799 to 1825, Laplace produced his monumental five-volume Traité de mécanique céleste (Treatise on Celestial Mechanics). In it, he completed Newton's work and extended Joseph Louis Lagrange's planetary work. Although Newton had believed that divine intervention would be necessary periodically to "reset" the solar system, Laplace showed that Newton's law of universal gravitation implied its long-term stability. When Napoleon observed that Laplace's voluminous treatise did not mention God as creator of the universe, Laplace replied, "Sir, I do not need that hypothesis." In 1796, Laplace published Exposition du systéme du monde,in which he stated in an extended footnote the idea that the solar system condensed from a rotating cloud of gas. This was the nebular hypothesis originally proposed by the philosopher Immanuel Kant without mathematical elaboration. In his analysis of the gravitational field surrounding a sphere, Laplace's equations predicted the concept of the black hole, whose characteristics were deduced much later in Albert Einstein's general theory of relativity. With Antoine Laviosier, his colleague at the Académie, Laplace worked on several problems in physics, including thermal conductivity and capillary action. He is best known to physicists for his theory of the potential, which is useful in studying gravity as well as electromagnetic interactions, acoustics, and hydrodynamics. Laplace contributed greatly to the field of probability and statistical inference. In 1774, using principles similar to those developed by Thomas Bayes, he derived essentially the same result involving integrals for determining probability, given empirical evidence. His Théorie analytique des probabilités ("Analytic Theory of Probability"), published in 1812 and expanded in 1814 with his Philosophical Essay, summarized all the materials known at that time in the area of probability, including the theory of games, geometrical probabilities, the theory of least squares, and solutions of differential equations. In his probability work Laplace introduced the idea of the Laplace transform, a simple and elegant mathematical technique for solving integral equations. Some of Laplace's contributions to probability were derived from questions in astronomy, for example, the central limit theorem which applied to the inclination of the orbits of comets. Laplace believed that through probability mathematics could be brought to bear on the social sciences, and suggested applications in insurance, demographics, decision theory, and the credibility of witnesses. In 1786, he published a study of the vital statistics of Paris, using probability techniques to estimate the population of France. In May 1790 the revolutionary government passed a law requiring standardization of weights and measures in France. The Académie Royale de Sciences was charged with making recommendations, and Laplace, along with Lagrange and Gaspard Monge, served on the committee appointed to consider the issue. They made recommendations for units of length, area, volume, and mass, with decimal subdivisions and multiples. They also devised decimal systems for money, angles, and the calendar. The basic unit of length as it was defined was named the "meter" at Laplace's suggestion. The decimalization of angles and the calendar lasted only a few years, but the other metric units were gradually accepted around the world. In the late 18th century and into the 19th century, Laplace dominated the Académie Royale des Sciences, imposing his scientific preferences and deterministic ideology on younger colleagues. He presided over the Bureau des Longitudes, which addressed the needs of astronomy and navigation, taught at the École Normale when it was opened briefly in 1795, and in 1800 was instrumental in creating the governing body for the École Polytechnique (founded in 1794), where he served as a graduation examiner. Laplace was known for the "rapidity" of his teaching, and in his writing he became known for his use of the phrase "it is easy to see," by which he skipped steps in his explanations, confounding some of his later readers and translators. Laplace's prominence in science brought him conspicuously into the political arena, where he served on numerous blue-ribbon commissions, including a commission that investigated hospital care. In 1799, Napoleon appointed him minister of the interior, but dismissed him after six weeks to place his brother in the position and appointed Laplace instead to the senate, where he eventually became chancellor. Later, Napoleon made Laplace a count of the empire and conferred upon him France's highest honors, the Grand Cross of the Legion of Honor and the Order of the Reunion. At one time, however, Napoleon noted that Laplace was a "mathematician of the first rank," but a mediocre administrator. As a member of the senate, Laplace voted against Napoleon in 1814, supporting Louis XVIII instead. After the restoration of the Bourbon monarchy in 1815, Laplace was rewarded with the title of marquis and was appointed president of the committee to oversee the reorganization of the École Polytechnique. His political opportunism allowed him to prosper and to continue his scientific work. Laplace retired to his country estate in Arcueil, near Paris, where he and Claude Berthollet, a chemist and physician who also boasted a distinguished career in the service of science and France, formed an informal school. The discussions of the Société d'Arcueil were published between 1807 and 1817. Although Laplace has been criticized for his arrogance, unreliability in giving credit to others, and wavering allegiances, he is considered to be France's most illustrious scientist in its golden age, and one of the most influential scientists of all time. Laplace had an acute mind and was generally healthy and vigorous until the end. 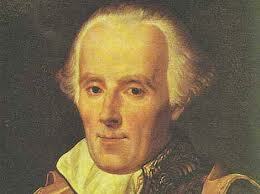 After a short illness, he died on March 5, 1827, at Arcueil, just short of his 78th birthday. At his funeral, he was eulogized by many, including his student Siméon-Denis Poisson, who called him "the Newton of France." Laplace was buried at Pére Lachaise. In 1878, the monument erected to him was moved to Beaumont-en-Auge, and his remains were transferred to the small village of St. Julien de Mailloc. Laplace's papers were destroyed by a fire at the château of Mailloc in 1925, which was then owned by his great-great grandson, the comte de Colbert-Laplace.